Dwight Okawa | Nagamine Okawa Engineers Inc.
Dwight Okawa has been practicing structural engineering and ocean engineering since 1974 and joined Nagamine Okawa Engineers in 1999. His specialties include water and wastewater facility design, and bridge design and inspection. He has been responsible for overseeing more bridge inspections than any other engineer in Hawaii and is an expert in this field. His subspecialty includes wharf and waterfront structures. Another subspecialty includes the design of hospitals and medical facilities. He has broad experience in Hawaii and throughout the Pacific such as Guam, Japan, Okinawa, Saipan, Rota, Tinian, Palau, Philippines, Midway, Johnston Island, Kwajalein, Niue, and Diego Garcia. He is a licensed structural engineer in Hawaii. 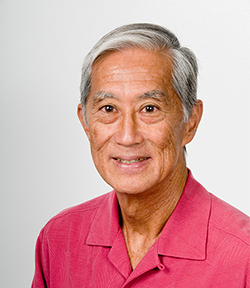 Dwight Okawa has his Bachelor of Science degree from the University of Hawaii and a Master of Science degree from the Massachusetts Institute of Technology.